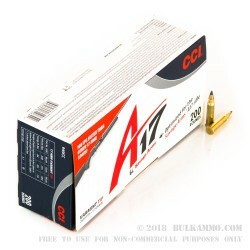 This 17 HMR cartridge from CCI provides unique velocity and bullet expansion for small game hunting. Its muzzle velocity is 2650 feet per second, and its Varmint Tip bullet is designed for rapid expansion upon impact. These attributes make this CCI offering a great option for taking squirrel, prairie dogs, groundhogs, or other small game. 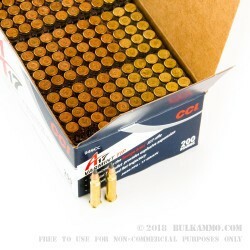 Manufactured by CCI out of Lewiston, Idaho, this 17 HMR cartridge is available in a 200 round box. 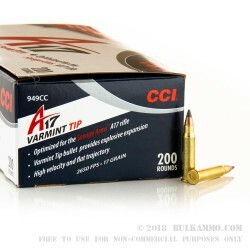 One note from CCI about this particular product: for use in any firearm other than a 17 HMR rifle platform, be sure to first run it by your firearm manufacturer. You know I may not be the most profitable customer BA ever had but I will say that I have to be among the most loyal. Because of what they sell and the way they sell it has earned my business for life. Review by Prairie pest exterminater.